Chinese navigators and fishermen, as well as those of other States, had historically made use of the islands in the South China Sea, there was no evidence that China had historically exercised exclusive control over the waters or their resources. The Tribunal concluded that there was no legal basis for China to claim historic rights to resources within the sea areas falling within the ‘nine-dash line’. Lawfulness of Chinese Actions: The Tribunal next considered the lawfulness of Chinese actions in the South China Sea. Having found that certain areas are within the exclusive economic zone of the Philippines, the Tribunal found that China had violated the Philippines’ sovereign rights in its exclusive economic zone by (a) interfering with Philippine fishing and petroleum exploration, (b) constructing artificial islands and (c) failing to prevent Chinese fishermen from fishing in the zone. The Tribunal also held that fishermen from the Philippines (like those from China) had traditional fishing rights at Scarborough Shoal and that China had interfered with these rights in restricting access. The Tribunal further held that Chinese law enforcement vessels had unlawfully created a serious risk of collision when they physically obstructed Philippine vessels. Convention to decide the dispute presented by the Philippines. The Tribunal is composed of Judge Thomas A.
H.A. Soons of the Netherlands, and Judge Rüdiger Wolfrum of Germany. Judge Thomas A. Mensah serves as President of the Tribunal. The Permanent Court of Arbitration acts as the Registry in the proceedings. Jurisdiction and Admissibility, the Rules of Procedure, earlier Press Releases, hearing transcripts, and photographs. 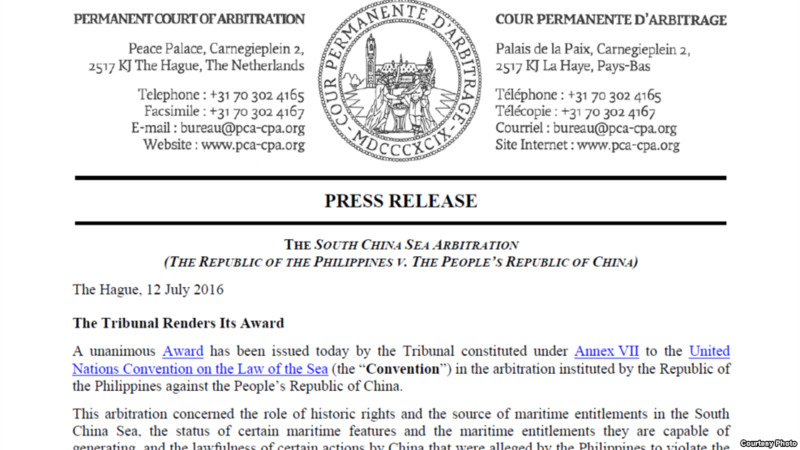 Procedural Orders, submissions by the Philippines, and reports by the Tribunal’s experts will be made available in due course, as will unofficial Chinese translations of the Tribunal’s Awards. State entities, intergovernmental organizations, and private parties. The PCA’s International Bureau is currently administering 8 interstate disputes, 73 investor-State arbitrations, and 34 cases arising under contracts involving a State or other public entity. The PCA has administered 12 cases initiated by States under Annex VII to the United Nations Convention on the Law of the Sea. Professor Philippe Sands; Professor Bernard H. Oxman; Professor Alan E. Boyle; Mr. Lawrence H. Martin.